We’re raising funds to support student financial aid at StFX, and we need your help to do it. On Tuesday, November 27, 2018, StFX is joining the global Giving Tuesday movement, a 24-hour initiative that links organizations across the world as they raise funds for important local and international causes. 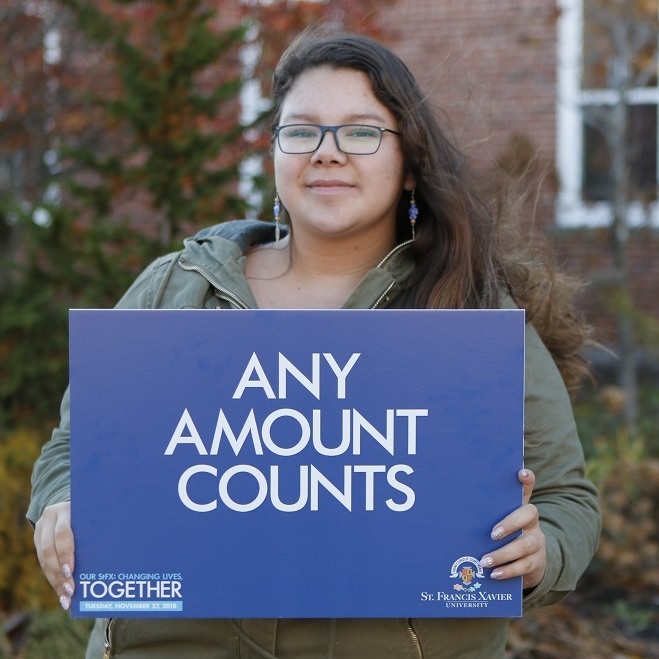 As part of Giving Tuesday, StFX is raising money for student financial aid programs. What is student financial aid at StFX? We want to make sure any StFX student who needs financial aid programs can access them. Why Does Student Financial Aid Matter? In many ways, it's never been more expensive to be a student. Financial hardship can make it challenging for students to focus on their education, and even with government-funded student loans many still work multiple jobs to cover living expenses and tuition fees. The challenge is made even harder for students with young families or other dependents. For these students, financial aid programs are a lifeline. Need-based bursaries take away some of the pressure to cover tuition and textbook costs, while other initiatives like the emergency grocery card program mean that students don't have to go without basic necessities in an unexpected financial crisis. So why does student financial aid matter? Because it lets students focus on their education instead of stressing about how to pay for it. When students have more time to devote to their studies, they are more likely to excel at their academic and personal goals. It's simple: No one should miss out of the dream of a StFX education because of financial need. That's why we're raising funds to ensure that financial aid programs are in place for any StFX student who needs them. But we need your help! On November 27th, make a gift to support student financial aid at StFX. Tell your friends and family about this initiative. Spread the word on social media, using the hashtag #OurStFX. Contact a member of our Development team to discuss how you can get involved. If you're a current StFX student, young alumna or alumnus, or making your first gift to StFX in the past five years, your gift will be matched dollar for dollar. This means your $20 gift will have a $40 impact! This gift match is made possible thanks to generous members of the StFX family. Individual gifts will be matched to a maximum of $500. A grand total of $25,000 in matching funds is available. stronger tomorrow for StFX students.